The Fund recognizes that young investigators may find it difficult to remain in pediatric research because of a lack of funding. Therefore, the purpose of this program is to encourage the development of medical research in child health by awarding small grants to new researchers, helping them gain a foothold in this important area. The goal is to fund applicants who will go on to be independent investigators. The Fund will make up to 30 awards total with two funding cycles (15 awards each). The Fund is open to a wide variety of research topics. We do not focus on a particular ​disease, but all our funded projects deal directly with children's health. In the Early Career Award Program, the Fund is particularly interested in applicants that show great potential to impact that field of children's health through medical research. Both an applicant's aptitude and inclination toward research are considered. The quality of the mentor and the mentoring relationship are also considered to be important predictors of success. 1. Physicians who are in a residency/fellowship training program, or who completed that program no more than one year before the date of submission of the Concept Paper. 2. Post-doctoral researchers who received the doctoral level degree no more than three years prior to the date of submission of the Concept Paper. A new investigator who holds a National Institutes of Health (NIH) K award (including a K12 award) or a Clinical and Translational Science Award (CTSA) is not eligible to apply for the Early Career Award. Each project needs to be under the guidance of a mentor. The qualifications and experience of the mentor will be considered in the evaluation of the application. A mentor may have only one Thrasher Research Fund Early Career Awardee at a time. There are no restrictions with regard to citizenship. The Fund is open to applications from institutions both inside and outside the United States. Applicants who excel in this category have demonstrated commitment to a research career that will find solutions to children’s health problems. These applicants should demonstrate the potential to eventually become independent principal investigators. All applications are expected to have a novel, scientifically sound, hypothesis-driven approach. Projects should be feasibly accomplished between 1-2 years. In the Discovery/Development/Delivery paradigm, most of our grants fall into the Development category, though excellent applicants in the Discovery and Delivery categories are occasionally funded. Delivery: Implementation science, operations research, health services, quality improvement. Both the incidence and severity of the children’s health problem are considered, including the resources and treatments already available to the problem. The line of research ultimately h​as the potential to meaningfully advance the field. Positive results will significantly improve child health, address an important research gap, and be widely translatable. While no applicants are perfect in all areas, successful applicants typically excel in most of the selection criteria listed above. Unsuccessful applications are usually weak in multiple areas. An audit of our previous concept paper submissions shows that the primary reasons for rejection were a combination of a longer distance to clinical applicability and either a weaker applicant or an unclear pathway to impact. We do fund a limited number of proposals with a longer distance to impact, but the applicants and mentors are excellent and the research has a clear pathway to impact child health. The following deadlines apply for the 2019 Early Career Award Program. There​ will be two cycles in 2019 with up to 15 applications awarded in each cycle. If awarded, please note that projects must receive IRB approval within six months of the award notification date, listed below. Please plan accordingly. Administratively, we needed to change the spring 2019 cycle concept paper submission date from March 12th to February 28th- if this caused any confusion, please contact the fund staff directly. The grant amount is based on the actual budgetary needs of the project, with a maximum of $25,000 in direct costs for the entire grant. The duration of the project can be up to two years. Indirect costs of no more than 7% of direct costs will be paid on Early Career Award Program grants. Up to $12,500 in total of the proposed budget may be used for salary (including fringe) of the new researcher. Funds not needed for salary are to be used for research supplies or other research-related expenses. The cost of attending one conference is allowed for the applicant to report findings resulting from Thrasher-supported research. Such travel costs may not exceed $2,000. Requests for purchase of major equipment (items >$4,000) are discouraged and rarely funded. A Thrasher Early Career Award project does not need to be fully encapsulated within the $25,000 award provided by Thrasher. 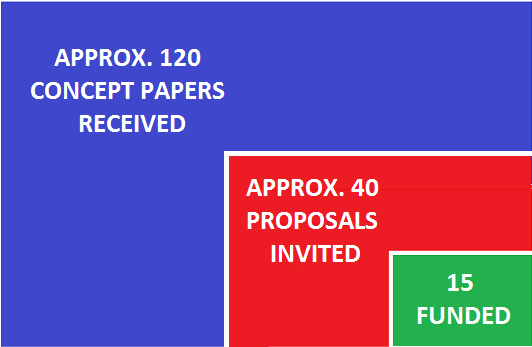 It is common for other sources of funding to contribute to the successful completion of a research project, such as funds from the mentor's lab. Demonstration of sufficient funds to complete the project is a consideration for the Fund's Advisory Committee. Early Career Award applications are submitted using two-step process. First, complete and submit the Concept Paper through our online portal​. Applicants whose concepts generally fit with the current priorities of the Fund are invited to submit a full proposal. Full proposals are reviewed by the Fund's Advisory Committee.